With the REXEED dialyzer, Asahi has achieved a new level of overall performance in dialyzer design by combining the polysulfone membrane REXBRANE with a jacket design that allows for optimum flow dynamics. Incorporated on the inner surface is Asahi's unique hydrophilic gel layer technology. This minimizes blood membrane interaction and plays a crucial roll in ANTICOAGULATION requiring, LESS HEPARIN!! 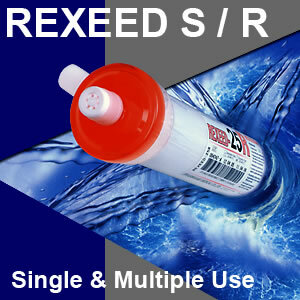 REXEED has been developed to provide well balanced and comprehensive small molecule clearance. This is demonstrated by the triangular graph and bar graph below. ASHAI WET-TYPE series dialyzers is not isotonic saline. Inadequate priming may lead to hemolysis or other adverse reactions. During the procedure, one should verify that leakage from the dialyzer, bloodlines, blood ports, and their connecting parts does not occur. 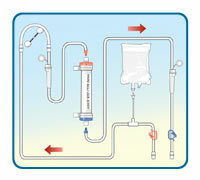 Place the dialyzer vertically in the holder with the red header (arterial end) facing upward. Secure the arterial and venous blood lines to the dialysis machine. Do not attach the blood lines to the dialyzer at this stage. 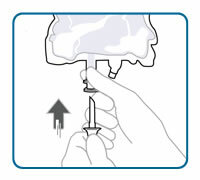 Connect the arterial blood line to the saline bag for Infusion. Open the clamp on the saline line and completely fill the arterial blood line to the dialysis machine with saline. Thereafter, close the clamp on the arterial blood line. Fill the arterial blood line to the dialyzer with saline by using the blood pump or under gravity. The drip chamber(s) should be filled with saline up to the appropriate level, according to the instructions for the blood line or dialysis machine. Stop the pump or pinch the blood lines with forceps once you have completely filled the arterial blood line to the patient and the one to the dialyzer with saline. 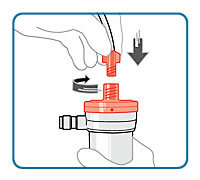 Remove the stopper from the red header of the dialyzer and connect the arterial blood line to the red header. example, place it in a medical fluid waste bag. Open the clamp on the venous blood line and feed saline at approximately 100mLmin by using the blood pump or under gravity until 1L of saline has passed through the dialyzer. If air is trapped in the dialyzer or the blood lines, add more saline for rinsing while gently tapping the dialyzer with the hand or pinching and releasing the blood lines by using forceps until the air is completely removed. Do not attempt to remove the air by tapping the dialyzer with hard instruments, such as forceps, because the instruments may damage the dialyzer. The drip chamber(s) should be filled with saline up to the appropriate level as per the instructions for the blood tubing line or the dialysis machine. Close the clamps on both the arterial and venous blood lines. 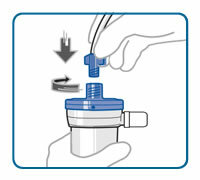 Remove the stoppers from the dialysate side of the dialyzer. 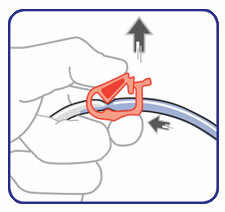 Connect the dialysate lines of the dialysis machine to the dialysate ports of the dialyzer in a way that the dialysate flows from the blue to the red header, in the direction opposite to the direction of the blood flow. 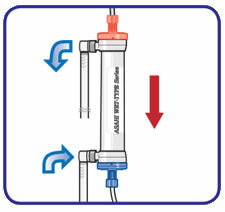 Spilling of the fluid from the dialyzer should be avoided by placing the dialyzer in a horizontal position with the dialysate ports facing upward when connecting the dialysate lines to the dialysate ports. 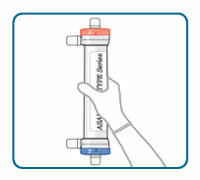 Secure the dialyzer with the red header facing upward. 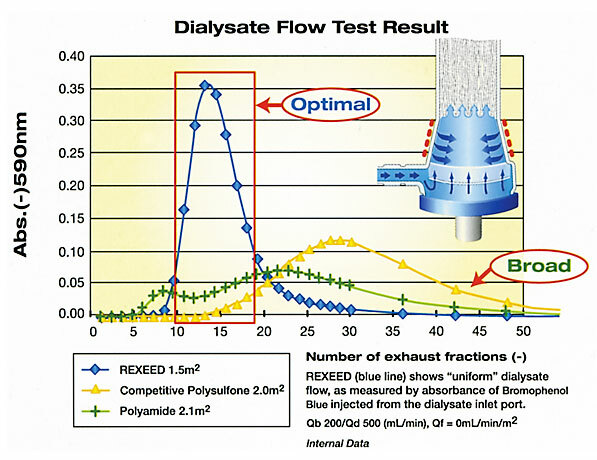 Rinse the dialysate side of the dialyzer with saline at a flow rate of 500 mL/min for 2 or more minutes without negative pressure. 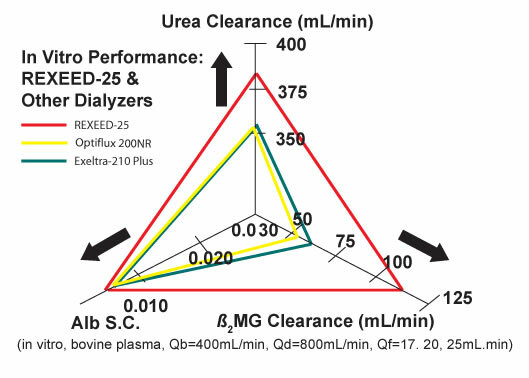 *The colored dialysate line connectors of the dialysis machine cannot be relied on when deciding the direction in which the fluid flows through the dialyzer. The color of the dialysate line connectors of dialysis machines can differ among manufacturers. *The priming of the Asahi WET-TYPE series dialyzers is now complete. Treatment may begin, or, according to the unit procedure, saline may be recirculated until treatment begins by connecting the arterial and venous blood lines, opening the saline clamp, and restarting the blood pump at a low flow rate with the red header facing downward. At treatment onset, the dialyzer may be rotated such that the red header faces upward.